Que s'est-il passé avec Siobhan ? 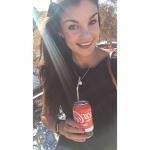 My name is Siobhan and I am a responsible, 25 year old native English speaker from New Zealand, looking for Work to support me while I am in Toulouse doing volunteer work. I have a car so am able to travel up to 30 minutes outside of Toulouse depending on how long you need me to babysit. I am interest in one off jobs as well as permanent arrangements. Please feel free to contact me if you would like to meet me face to face.